Clean & Clear used Snapchat filters across US schools to create a positive message for teens to use its products. This case study looks at how the skincare brand achieved 7% lift in brand favourability with a smart social media campaign. •	Used Snapchat to help raise awareness of its Morning Burst facial cleanser among females age 13 to 24. •	Filters launched in high schools and college campuses to give its audience a way to frame their selfies and send them to friends. Clean & Clear looked to Snapchat to help raise awareness of its Morning Burst facial cleanser among females age 13 to 24. Clean & Clear wanted to create ads in a few different formats to engage Snapchatters in a variety of ways — a video ad to tell a story in motion, a written segment to offer tips, and an interactive ad that would inspire viewers to get creative. 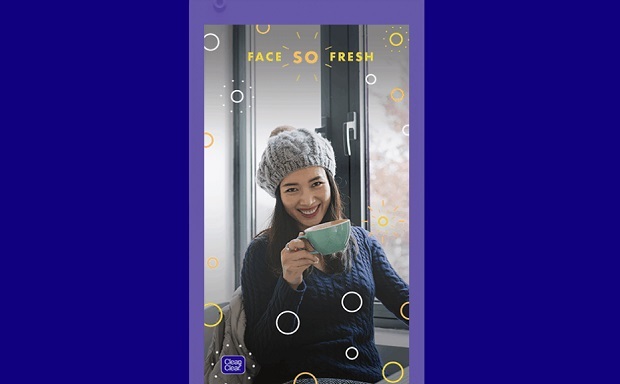 Clean & Clear launched its Filters over high schools and college campuses to give its audience a way to frame their selfies and send them to friends. Sparkling bubbles and the positive message “Face so Fresh” resonated well with Snapchatters. Additionally, the creative’s Clean & Clear logo helped increase Brand Awareness among Snapchatters who both used or received the Filter. Clean & Clear ran a Snap Ads Articles campaign across Discover, as well as a takeover of Refinery 29’s Publisher Story to reach its intended audience. When Snapchatters saw Clean and Clear’s Top Snap, which read “Does your skin feel blah in the morning?”, they could swipe up to read helpful articles on proper skin care. Clean & Clear’s Snap Ads and Filters campaign generated an 11.2% lift in Aided Awareness (5.5X higher than Millward Brown Norms) and a 7% lift in brand favorability (3.5X higher than Millward Brown Mobile Norms).